The Theatre School at DePaul University is pleased to present IN THE HEIGHTS, music and lyrics by Lin-Manuel Miranda, book by Quiara Alegría Hudes, and conceived by Lin-Manuel Miranda, in the Fullerton Stage Theatre in the new Theatre School building located at Racine and Fullerton. 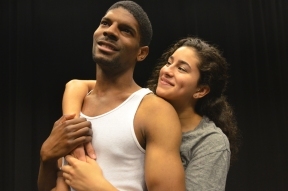 The production, directed by Lisa Portes, premieres on Friday, October 3, and runs through Sunday, October 12, 2014. Performances are Wednesdays through Saturdays at 7:30 PM and Sundays at 2 PM. Previews are on October 1 and 2, at 7:30 PM. All tickets are reserved seating. Tickets are available by calling (773) 325-7900 or visiting the online box office at http://theatre.depaul.edu.